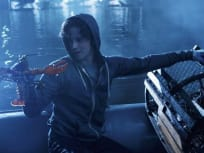 On the Revenge season finale, Emily plans to finish off her adversaries as the Graysons continue to self destruct but in the end an explosive event may change everything. 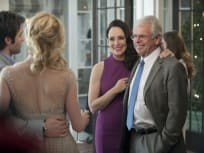 On Revenge, a devastating death brings Jack and Emily closer together while Nolan's undercover assignment puts him in danger. Back in 2002, Amanda Clarke starts reading her father's journals and begins her plan to seek out Revenge. 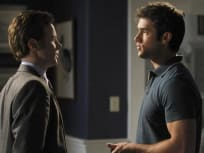 The press give Daniel a hostile reception while Emily finds a surprising link to her father's past on Revenge. As Daniel's trial continues, Victoria gets more desperate and Declan's testimony shakes a fragile Charlotte. 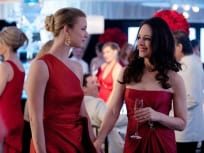 Emily uncovers surprising news about her father's death on Revenge. Victoria takes drastic measures to get Daniel out of prison. Who will be set up for murder on Revenge? Who will be the fall guy for Tyler's murder and has Emily lost control of her plan for Revenge? When Emily's plot for Revenge takes a dark turn at her and Daniel's engagement party, who will end up bleeding on the beach? William Devane plays Grandpa Grayson who arrives just in time to see the Grayson family and Emily's plans for Revenge spiral out of control. As Victoria's secrets come out, they have dire consequences for all involved on the latest Revenge. When Emily targets an author who profiled her father she gets more than she bargained for on Revenge. Conrad shows how dirty he's willing to get in the divorce. When a surprise guest crashes Daniel's birthday, who will survive on this week's Revenge. Will Nolan remain loyal to Emily and can she still trust Amanda with her plot for Revenge? As Tyler and Amanda continue to cause problems, Emily contacts her mentor for advice on her plot for Revenge. As Victoria becomes increasingly alone, she finds a surprising ally. Now that Lydia's awake and Amanda's in the Hamptons, will Emily's plot for Revenge unravel? Will Emily's plan for Revenge be halted when Frank unearths a secret from her past and what truths are revealed at the Graysons 25th Anniverary dinner? Will the "Intrigue" surrounding Lydia's fall be the undoing of Emily's plot for Revenge? A vindictive Lydia returns looking for Revenge as Victoria copes with the "Guilt" of past actions. 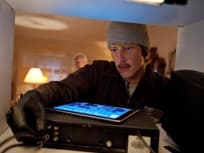 Now aware that he has been betrayed, Daniel decides to make a major change. 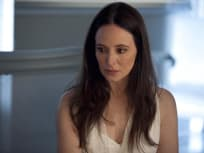 In "Duplicity" Emily seeks her Revenge on the psychiatrist responsible for institutionalizing her as a child as Declan and Jack face a tough decision. 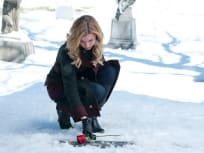 Emily seeks her Revenge against the district attorney for his "Betrayal" against her father as Victoria tries to confirm her suspicions about Emily's past. On Revenge, Emily gets to work on her next target, a former family friend who testified against her father. Victoria shows little "Trust" as she investigates Emily's past. In this gripping "Pilot" a young woman changes her identity and moves back to the Hamptons to seek Revenge on those who destroyed her father years earlier. Two wrongs can never make a right because two wrongs can never equal each other. Permalink: Before you embark on a journey of revenge, dig two graves. Revenge Opening 9 Minutes fro "Duress"